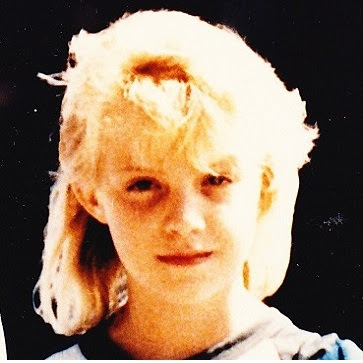 It is getting on to the twenty-one year mark since my daughter's kidnapping. There has been some interest in her case lately (which I will write about later), which has started me thinking. One of the things that makes Michaela's case news now, over twenty years later, is that the police and FBI are still actively and passionately investigating the case. That is amazing and such a blessing! I think this should be news that is spread far and wide, to let other police agencies know what they should be doing. I thought it was absolutely appalling when the Portuguese investigators announced that they were "closing the case" just one single year after little Madeline McCann disappeared in their jurisdiction. CLOSING the case? What does that mean? I can understand, "we have not been able to solve the case with the information we have," but does that mean that they cease to investigate new leads that might come in, that they stop looking for Maddy's eyes in the children passing in the street? Really, our police department has always had someone assigned to Michaela's case, but it's just been in the last couple of years that we've had an investigator with such compassion (and passion) that he's been lighting fires to solve the case. That is Inspector Rob Lampkin. And may he become world famous for solving a case over 20 years old! But the thing is, there is something in me that has awakened in the last few years as well. 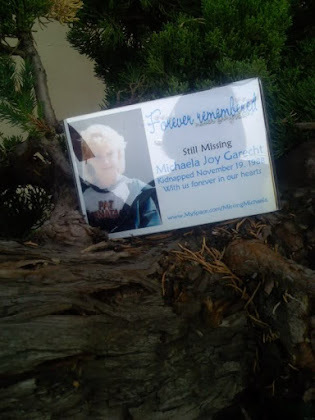 I spent the first couple of years after Michaela was kidnapped doing the missing children things, doing mailings, seeking publicity, just to get her face (and her kidnapper's) out there. I had a missing children's organization for a short while, but there are dozens of nonprofits devoted to missing children, way more than the world needs, all trying to get the job done with limited resources. The world did not need another one. But there really was a tremendous need for my energy somewhere else, and that was with my other children. They suffered also from what happened to their sister. Alex, my oldest, suffered the most ill effects. 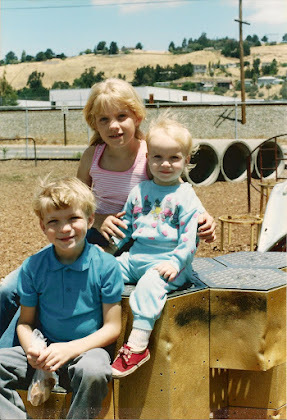 Libby, who was three at the time Michaela was kidnapped, told me at the age of maybe six that she was jealous of Michaela because I always talked about her, and I cried about her. I told Libby that I may talk about Michaela, but got to talk to her, and that she made me smile, and that was really much better. But rocky roads of healing lay yet ahead for our family. 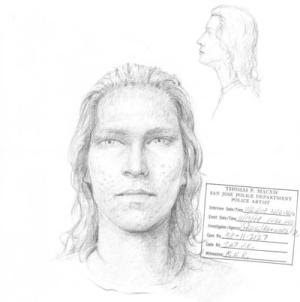 Robbie, who was seven months old when Michaela was kidnapped, suffered the least. In fact, perhaps he benefitted, because I spent so much of the months following Michaela's kidnapping just holding him. It was protective, because there were so many people coming and going to our house that I coudn't put him on the floor or he might get stepped on. But it was also healing for me. As I held him, he molded himself to me as babies do, warm and soft, heart to heart, and it helped soothe my pain. 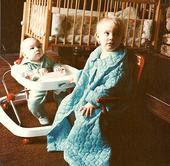 All my children helped save my life in those years. I lost my faith, I lost my hope, and the only thing that kept me from completely losing my heart, my ability to be open to love which I had come to know as so painful, was my children. Only Alex remembers Michaela, but the impact to the heart doesn't require memories to be engaged in the mind. So I kept up on Michaela's, but I stopped pursuing "the cause." I turned my focus to my children. They needed me, and I needed them. In the time since Michaela has been gone, there has not been a day that has gone by that she has not been in my mind and my heart. Whenever there came things that could be done, I did them. I was blessed over the years with various friends and volunteers with whom I could engage in amateur investigations. 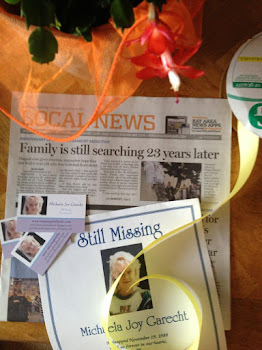 I carried Michaela's case with me through the years like a jumble of jigsaw pieces, laying them out on the table, trying to put them together. Unfortunately, I was able to put those pieces together in various ways so that they formed totally different pictures! What could I do with that? It was endlessly frustrating, I can tell you, but as long as I was able to come across these puzzle pieces, I was compelled to keep shifting them here and there, trying to find in them the ultimate truth. Over the years, things still came up that were newsworthy, and I responded to calls from the media. 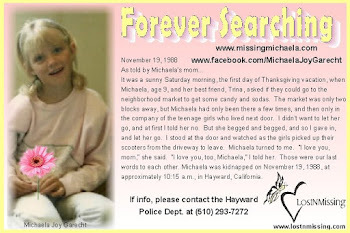 I got most of my information about what was going on with Michaela's case from our local Fox affiliate, KTVU-2. They would call me at 5:00 in the morning and ask if they could stop by and interview me before I went to work. I'd be sleeping of course, so I'd be running over in my mind whether or not it was okay to have company before work, when I'd think to ask, "Why?" Of course it was always because there was something going on in the case. So I'd say yes. I'd spend my time with the media. Some of the things that came up were big enough to draw attention from national media, and when the talk shows called I'd be on a plane to New York, Boston, Los Angeles. I did this because they asked. I did this because everyone has told me from my very first very reluctant appearance before a TV camera that this exposure might help Michaela. But I know that I did this largely because I feel compelled to keep Michaela alive. You know, she was a gift to the world. And though she is gone, although she is lost, she is still a gift to the world. I am her mouthpiece, trying often to figure out just what it is she has to tell the world, but determined to tell it. To that end, I have always written about Michaela. From the first year to the current year, I have written, and written, and written, and I am still writing. Much of it was to myself, but I created a myspace for Michaela on her birthday one year when I couldn't think of what else to do to honor the day. I have written lots of blogs, bulletins, and messages, and they are all tied to Michaela, though they may be threads so slender that they can only be seen when the light hits them at the right angle. I have been writing a book, Missing Michaela, for fifteen years. It is a message of hope and faith, which I oddly started writing at a time when I had no hope and no faith. I expect to have it finished this year. I guess that tells you something in itself. But I did withdraw a lot, for a long time. At one point, I actually moved away from Hayward, to Castro Valley, and I didn't leave any forwarding number on my phone and didn't tell very many people where I was going. This was over ten years after Michaela's kidnapping, so probably nobody noticed much. I'd been through a lot of really difficult times and I just wanted a place to rest. I went around humming the Cheers song, only the words in my mind were, "Sometimes you want to go where there's no one who knows your name." For years after that, people would say to me, "You look so familiar," and they'd be searching for where they knew me from -- what high school I attended, where I'd worked, where I went to church. Sometimes I'd tell them, and sometimes I wouldn't. But very few people said, "Oh, aren't you the mother of that missing girl?" Maybe some figured it out, but were just too polite to say anything. Or they just didn't know what to say. I know I didn't. When it did come up, I'd try to change the subject quickly. It's not that I have a reluctance to talk about Michaela, but I just didn't know what to say that could fit into a casual encounter. But here I am, over twenty years later, and I have realized that somehow, without really trying, I have started to move back into a public forum. Suddenly I have messages I want to get out. I have written and published a book about child safety, and a friend is working on a dramatic presentation based on that book which we hope to be able to present in schools, child safety fairs, etc. I have started speaking in public. This was something I felt I needed to do, but I have to tell you it was with reluctance. My high school social studies teacher (Mr. Wishnoff) will tell you that I just flat refused to do oral reports. Because of that, I have never sought out public speaking engagements. I am really much more comfortable writing. But speaking engagements have started coming to me. So I'm doing it. I have wondered why this is happening now, twenty years later. It is true that my children are pretty much grown up. My youngest will be sixteen in a few months. So I have a bit more freedom to do it. But I didn't wake up and say, "My nest is getting empty, so I'm going to do this." The various things have come to me, surprised me even while I embraced them. Given the fact that the investigation has actually picked up, I've wondered if this has anything to do with Michaela, if perhaps now is the time, and we will find her. Maybe Michaela herself is out there, an adult now, and maybe she will see, maybe she will hear, maybe she will read my words. Maybe she will know that we are still looking for her, that we still love her, that there is absolutely nothing that could have happened to her that could possibly make me love her any less than I did on that first day that I held her in my arms! Or maybe somebody else will see, and they will come forward with the knowledge they have been holding onto for all these years, and I will at least know what happened to my daughter. Apart from child safety, a large part of the message I have to share is my faith, so I think that it might have to do with God's timing as well -- and let me tell you, he has done some amazing things here! But it's here: this time, the opportunities, the things that are on my heart. I never wanted to be on this path to begin with, but I will walk it with as much faith and love and hope as I can. That is what I can do, for my daughter, for the children in the world, and for my God. I have stumbled upon your blog while looking up cases of missing children that turned up years later. 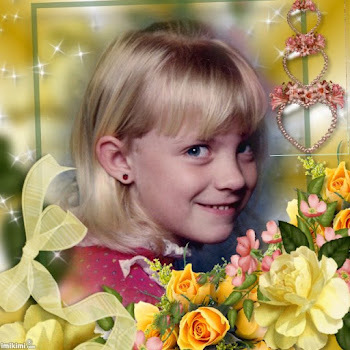 As I have followed the Madeleine McCann's case with interest (I am Portuguese), just wanted to tell you that, in fact, the Portuguese investigation is not "closed": like everywhere else, a missing person's case is never closed but, as you probably know too well, there is a point where the agencies stop looking actively or, at least, it seems so. The Public Prosecution office has said that they keep receiving leads but, unfortunately, none of them credible enough to restart investigating in one direction or another. There is also in Portugal a 12-year old case of a missing boy, Rui Pedro (they are exceedingly rare there, thank God) that has been rekindled a while ago with no success, unfortunately.